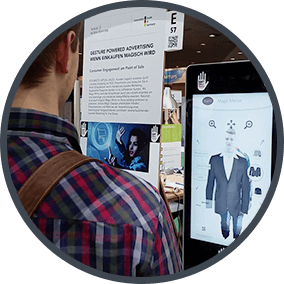 Magic Schaufenster combines augmented reality and gesture recognition into a magical, memorable consumer experience which captures attention, presents your products and brand in a conceptually new way, and converts passers-by into customers. The power of Augmented Reality Marketing at its fullest. 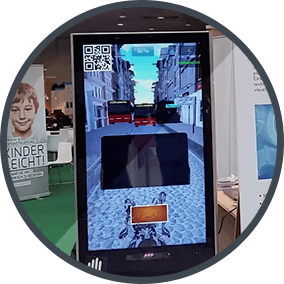 By using an innovative approach, based on gesture and voice recognition, Magic Schaufenster is a touch screen alternative which breaks through the clutter of traditional means of advertising and effectively promotes your products or services. It’s easy to miss an ad. It’s hard to miss a crowd. A customer gesticulating in front of your digital sign attracts attention. As a result, other people crowd up in front of it and get to learn about your products or services. By providing your potential customers with a distinctive experience, Magic Schaufenster uniquely positions your products or services on the market, and increases the perceived value of your offerings. 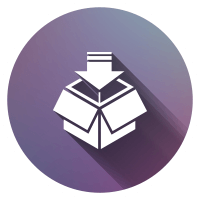 Magic Schaufenster integrates with your point-of-sale marketing activities and technologies to convert passers-by into customers, accept orders, and create an additional stream of revenue, even during your off-hours. People love sharing news. They’ll take pictures and videos of others interacting with your digital advertising, and will post that on social media. This promotion is supported by integrated social media buttons. The result is a snowball of interest to your company. Innovative experience influences people. 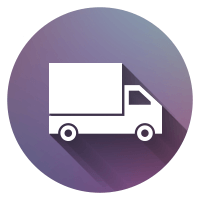 Creative digital advertising solutions from Magic Schaufenster communicate the value of using your products or services in a way that people simply can’t resist. The entertaining shopping experience created by Magic Schaufenster increases customer satisfaction, stimulates them to come back more often, and helps them continuously pick your products over the competition. By making people interact with your advertising in a new, entertaining way, Magic Schaufenster increases the time they spend with your brand or at your store. The more time they spend learning about your products or services, the more likely they are to make a purchase. 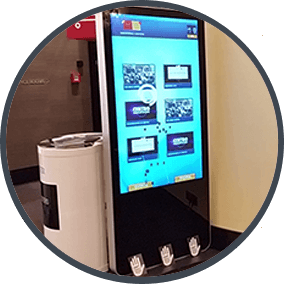 The concept of digital signage has been around for years… At Magic Schaufenster, we’ve moved that concept a step further by combining it with a gesture controlled interface which incorporates voice recognition and simulated reality. The result is something entirely new. Something that no longer fits into the concept of corporate signage. It’s a new advertising medium which changes the way marketing is done. 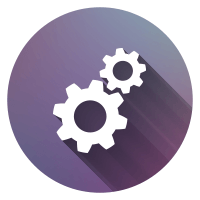 It’s a new way for customers to interact with your business, learn about your products, and make purchases. 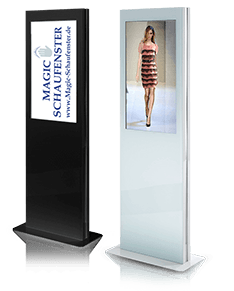 At Magic Schaufenster, we utilize our forward-looking technology to develop in-store, trade show, and outdoor marketing campaigns and sales tools.